Large-scale resource developments can threaten people's land and the quality of their environment. Now a new initiative is bringing grassroots organisations together with international lawyers to fight for resource justice. Around the world, large-scale resource developments threaten the lands and environment of millions of people. A new initiative, Lawyers for Resource Justice, helps to put power back into the hands of communities who are defending their rights and demanding responsible, fair natural resource development in their homelands. Rising global demand for natural resources has made community land protection an urgent priority, particularly in countries with little or no legal protection for community land rights. In the Koh Kong province of Cambodia, for example, several hundred villagers were violently displaced from their ancestral land to make way for large-scale sugar production. The Cambodian government illegally leased their farmlands to corporate interests. The villagers protested, sent formal complaints, and attempted to negotiate with both company and government officials. As these efforts met with no success, in 2010, two local non-governmental organisations (NGOs) contacted the International Senior Lawyers Project (ISLP) for help. Their volunteer lawyers helped formulate a legal strategy that moved the villagers' complaints beyond the jurisdiction of Cambodia's corrupt and ineffective judicial system. The villagers and ISLP decided to sue the two UK-based sugar companies involved in the plantation development in the English High Court of Justice, aiming to hold the two companies accountable for their role in the illegal confiscation of their land. The case is ongoing. In Kenya's Kerio Valley, the discovery of potential oil reserves has left local residents fearing displacement from their lands and the destructive impacts of oil extraction, as experienced in neighboring Turkana. In 2014, a community-based organisation from Kerio Valley requested ISLP’s assistance in representing the community with oil companies. The community wanted to obtain timely, clear, and complete information regarding oil development in the region. ISLP recruited a team of experienced volunteer lawyers, an oil and gas expert, a corporate social responsibility specialist, authorities on relevant Kenyan law, and ISLP staff. The team is working closely with the organisation to identify community concerns and priorities, and to develop strategies for engaging the oil developer and government officials. There are thousands of communities around the world who could benefit from similar international legal support to challenge irresponsible and exploitative resource development projects. A new initiative, Lawyers for Resource Justice, launched in April, can help. Lawyers for Resource Justice is a new collaboration between Namati, ISLP and Avaaz to connect national and grassroots organisations with the Global Legal Empowerment Network and link them to volunteer international lawyers. The lawyers provide customised legal support and access to international jurisdictions. This approach helps to empower vulnerable communities to use the law to protect their lands and environment and to amplify their voice internationally. This initiative brings together multi-disciplinary teams of lawyers and other experts to work with courageous national advocates and communities to develop strategies to prevent or remedy damages from large-scale resource development projects. Support ranges from providing legal training, to proactively engaging government and investors on proposed projects, to representing communities in litigation against existing projects. For example, in Liberia ISLP is supporting the Sustainable Development Institute (SDI), a national NGO, to establish a legal-aid programme that helps communities address the impacts of mining, forestry, and agribusiness. SDI asked ISLP for guidance and legal training on large-scale resource projects. ISLP's volunteer senior lawyer, who has 25 years of experience working with First Nations communities in Canada, travelled to Liberia and worked alongside SDI to strategise ways in which national lawyers could challenge irresponsible development projects, drawing upon SDI's knowledge of local priorities and Liberian law and the lawyer's international expertise. This initiative is founded on the belief that communities and grassroots organisations, not external experts, are the champions of resource justice in their countries. 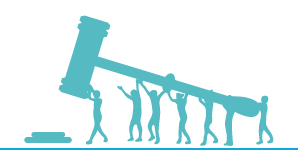 The approach of Lawyers for Resource Justice is to improve access to customised, strategic legal support – when and how local advocates choose. These collaborations between local advocates, community organisers and experienced experts can create powerful and effective ways for communities to protect their rights, their lands, and their environment and hold investors and governments accountable. Organisations seeking advice and legal support can make a request through resourcejustice.org. There is no application deadline but we cannot guarantee assistance to all applicants. Applicants are required to complete an initial short survey and follow-up interview to collect information about their situation and legal support needs. The only application criteria are: that the organisation works with a community that is facing an existing or proposed large-scale resource project; and that the organisation has at least one staff person able to liaise with Namati and ISLP in order to coordinate support. Groups working on proposed or anticipated resource development projects are particularly encouraged to apply because this allows for more proactive strategies. Natural resource development does not need to result in inequality, displacement, or pollution. Initiatives such as Lawyers for Resource Justice are a much-needed response to the imbalances in power and information that disadvantage communities facing resource development projects. By working together, grassroots and international experts can ensure meaningful respect for communities' rights and build global momentum for social and environmental justice. Marena Brinkhurst is a programme associate with Namati's Community Land Protection Programme. Groups wanting to apply for legal support can apply here.